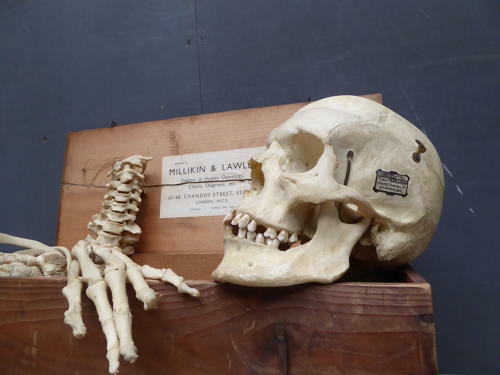 An exceptional example of an antique real bone medical half skeleton by Millikin & Lawley of London. An exceptionally original & complete example, the labelled pine box containing one hand, foot, a spine, set of ribs & many other bones, all 'wired' with cat gut for medical training purposes. The skull is cut & hinged, the jaw is sprung with brass springs & the side is labelled with the Millinkin & Lawley makers label. A fine example. This will not be to everyone's taste but if examples like this did not exist, medical science would not be where it is today! Wear commensurate with age, excellent condition overall with an ols repair to the box lid & the skull with a couple of missing teeth.